Bill Bennett was a track letter winner for the Hurricanes in 1954 and 1956 to 1958. Upon graduation, Bennett was considered the finest all-around track athlete in school history. 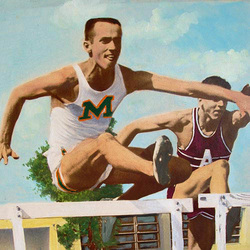 He came to UM from Miami Senior High School and competed in low and high hurdle events for the 1954 squad that finished with a 4-2 meet record. Bennett served as team captain for both the '57 and '58 campaigns, proving to be their highest scorer and most consistent performer. His wealth of talent and versatility were extremely valuable to an often undermanned team, as Bennett excelled in sprints, hurdles, jumps and relays. Bennett left Miami holding school records in the 100-yard dash, 220-yard dash and the 220-yard low hurdles. Bennett graduated from medical school at the University of Florida in 1966 and served as a regional medical director for Humana Medical Plan. He and his wife Kathy resided in Pembroke Pines, Florida and raised 5 children. Sadly, Dr. Bennett passed away on June 26, 2017 at the age of 82.